Twitter's Moments feature is great for adorable animal pictures. Just some of the delights that await you in Twitter’s Moments section. Twitter can be an unwelcoming place; the constant stream can prove unmanageable to those coming in from the outside. In theory, at least, Twitter’s new Moments feature exists to help quell that chaos. In practice, of course, Moments is most awesome as a venue for pictures of people’s pets. As Will Oremus and Lily Hay Newman explained earlier this month, Moments seeks to help users make sense of the rush of information that confronts them in their feeds. Because tweets appear in linear sequence—and because they can accumulate quickly when a story is developing—it can be difficult to contextualize any given missive once events are underway. Moments aspires to provide a meaningful foundation on which to build, cataloging the tweets that started it all, or at least those that explain how things started. That’s the goal anyway. Just days after the feature launched, Jordan Weissmann complained that the blue notification dot advertising new content almost never goes away. * Like a trick birthday candle, it keeps flickering back on every time you think you’ve blown it out. But given how eager it is to present its offerings, Moments doesn’t have a lot to show: As I write this, it’s featuring a handful of tweets about Hillary Clinton’s 68th birthday, a few more on the identification of processed meats as carcinogens, and Getty Images’ sports pictures of the week. By the time the Moments team gets to truly breaking news, however, it doesn’t always feel like it’s really breaking any more. But that doesn’t mean Moments is useless—far from it. 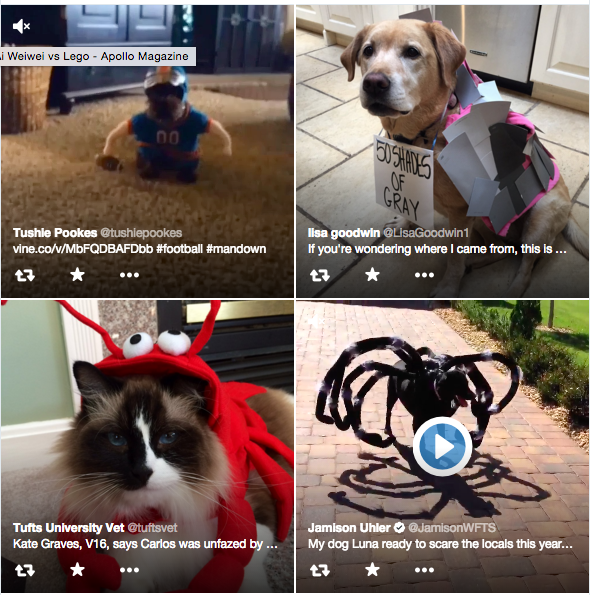 Consider today’s slide show, “Pets ready for Halloween,” a charming series of delightfully undignified dogs and cats in costume. There’s Luna, done up as a spooooooooky spider, and there’s Tita, who’s clearly all abuzz at the chance to present her bee costume. (In some cases Halloween seems to have gotten mixed up with game day: A few of the pups are done up in football colors.) Not all of these cats and dogs look happy with their garb, but the aggregate effect can only be one of joy. Twitter’s Moments is still new, but if its first weeks are any indication, it’s better at some things than others. As a news source, it’s been a bit of a bust thus far. As a vehicle for cute animal content, on the other hand, its future may well be bright. It’s easy to imagine that it’ll be a good font of the disposable and dumb in general, a place to catch Twitter itself at its most charmingly eccentric. There’s probably a lesson here: So long as curatorial services like Moments rely on human intervention, they’re unlikely to unseat established newsgathering operations. Twitter’s great because it lets you dive into events as they’re unfolding. Piecing them together after the fact isn’t about life in the moment; that’s just journalism as usual. Enough with the immediate, then! Bring on the adorable animals. They’re always relevant. *Correction, Oct. 26, 2015: This post originally misspelled Jordan Weissmann’s last name.